Daisy Jones is a young woman coming of age in L.A. in the late ‘60s, sneaking into clubs on the Sunset Strip, sleeping with rock stars, and dreaming of singing at the Whisky a Go Go. By the time she’s twenty, her voice is getting noticed. Also getting noticed is The Six, a band led by Billy Dunne. On the eve of their first tour, his girlfriend finds out she’s pregnant, and with the pressure of impending fatherhood and fame, Billy goes a little wild on the road. Daisy and Billy cross paths when a producer realizes that the key to success is to put the two together. Jennifer Hershey, SVP, Editor in Chief, Associate Publisher, Ballantine Bantam Dell, pulls back the curtain, offering glimpses into this book’s creation and special magic. Hershey shares her impressions of Taylor Jenkins Reid’s unique writing style, the book’s “oral history” format, and why DAISY JONES readers will be inspired to revisit their favorite ‘70s rock albums. How did you discover Taylor Jenkins Reid and what were your initial impressions of her writing voice? To say that I “discovered” Taylor would be a little like saying that Columbus “discovered” America! Before I had the huge pleasure of making the acquaintance of Daisy Jones, Taylor had written five terrific novels and won herself a devoted following. I loved the book right away—and read it in one sitting; it has a very addictive quality. I was struck by the freshness of the milieu and conceit of the book—a bit like the movie Almost Famous or A Star is Born, but the first time I’d seen that in book form—and the “as told to” narrative structure for a novel was so distinctive. How would you describe the editor/author process as this manuscript became a book and why do you think the “oral history” structure works so well? The novel was already in great shape when I acquired it, so we just had fun fine-tuning and tightening. We talked a lot about how to make the voices feel convincingly as if they had been spoken aloud, without going too far down that road. Taylor has said that the “oral history” format forced her to up her game as a writer, because everything she wanted to convey had to be done completely through the voices of the characters. I particularly love the way various characters remember the same event differently, and contradict each other in the telling. 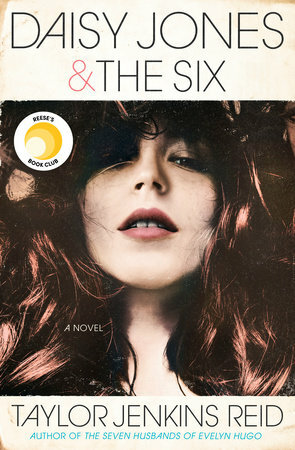 What aspects of DAISY JONES & THE SIX do you feel will resonate most strongly with readers? There is so much here: not just one, but two great love stories, a lot of ’70s and classic rock nostalgia (I guarantee you’ll pull out Fleetwood Mac’s Rumors for a fresh listen when you are done! ), and some great moments for the feminists in all of us. Reading the novel makes you feel like you are just hanging out backstage with your favorite band. It’s just such a fun and fresh read—the kind of novel that, despite its layers, almost reads itself to you, it is so effortless.